Located in Tehran, beside Laleh Park, and founded in 1976, the Carpet Museum of Iran exhibits a variety of Persian carpets from all over Iran, dating from the 16th century to the present. The museum‘s exhibition hall occupies 3,400 square meters (10,200 ft²) and its library contains 7,000 books. The museum was designed by the last Queen of Iran, Farah Diba Pahlavi. The perforated structure around the museum‘s exterior is designed both to resemble a carpet loom, and to cast shade on the exterior walls, reducing the impact of the hot summer sun on the interior temperature. Carpet-weaving is undoubtedly one of the most distinguished manifestations of Iranian culture and art, dating back to the Bronze Age, but as the materials used in carpets including wool and cotton, decay into dust during the course of time, archaeologists couldn‘t make any special discovery during the archaeological excavations. What has remained for us from the early ages as evidence of carpet-weaving are nothing more than a few pieces of worn-out rugs. Such fragments do not help very much in recognizing the carpet-weaving characteristics of pre-Seljuk period (13th and 14th centuries AD). Among the oldest pieces discovered are those found in Eastern Turkestan, dating back to the third to fifth centuries AD, and also 8 some of the hand-weavings of the Seljuks of Asia Minor on exhibit in Ala‘edin Mosque in Konya and Ashrafoghlu Mosque in Beyshehir, Turkey. These pieces attracted the attention of researchers earlier this century, and now they are kept in the Museum of Turkish and Islamic Art in Istanbul and the Mowlana Museum in Konya. In a unique archaeological excavation in 1949, the exceptional Pazyryk carpet was discovered among the ices of Pazyryk Valley, in Altai Mountains in Siberia. It was discovered in the grave of a Scythian prince by a group of Russian archaeologists under the supervision of professor Rudenko. Radiocarbon testing revealed that Pazyryk carpet was woven in the 5th century BC. This carpet is 1.83×2 meters and has 36 symmetrical knots per cm2.The advanced weaving technique used in the Pazyryk carpet indicates a long history of evolution and experience of this art. Most experts believe that the Pazyryk carpet is the final achievement of at least one thousand years of experience and history. 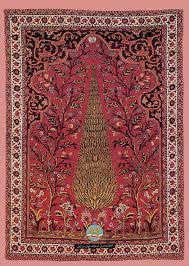 According to this theory the art of carpet-weaving in Iran is at least 3500 years old. In 1978, the founders of the Carpet Museum of Iran established this Museum with a limited number of Persian carpets and kilims, in order to revive and develop the art of carpetweaving in the country, and to provide a source to satisfy the need for research about the historical background and evolution of this art The Carpet Museum of Iran, with its beautiful architecture and facade resembling a carpetweaving loom is located on the northwest of Laleh Park in Tehran. It is composed of two exhibition galleries covering an area of 3400 m2.The ground floor gallery is assigned for permanent exhibitions and the upper floor gallery is considered for the temporary exhibitions of carpets, kilims, and carpet designs.